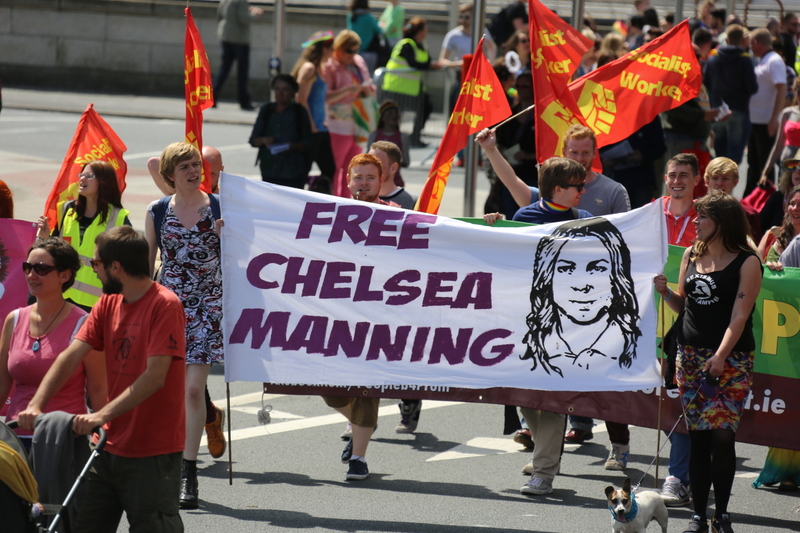 Chelsea Manning at London Pride, Time is on her side, Free Chelsea! 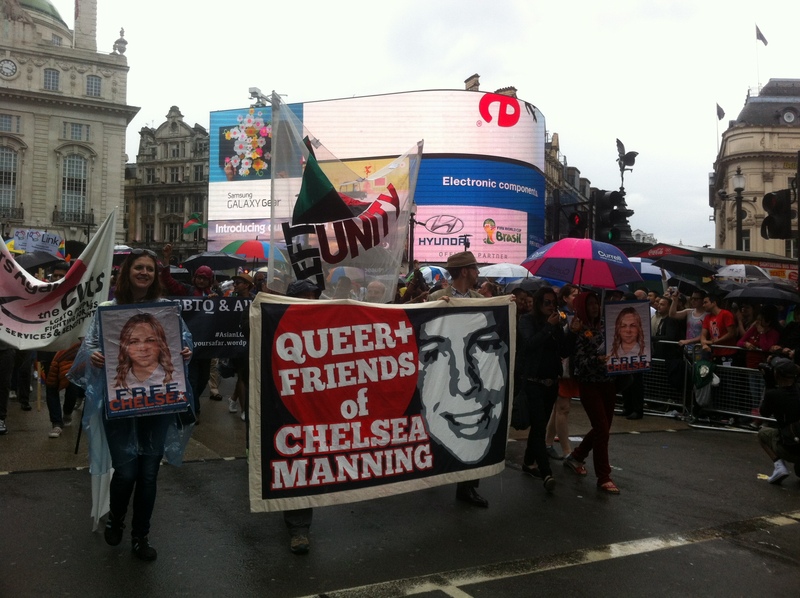 Queer + Friends of Chelsea Manning organised a wonderful contingent of support for our principled whistleblower by participating at this year’s London Pride March on 28th of June. A beautiful banner, thousands of flyers, stickers and badges, posters, all in support of a young person whose moral journey led her in selfless active service to humanity. As a soldier she showed bravery in following her values and dictates of her conscience and releasing to the world a gift of knowledge through WikiLeaks about how wars are conducted, how foreign policy is carried out and the unreported, often damning truth about how unchecked power dominates and determines the way we live, with no mandate, no debate, just because it can. Queer + Friends of Chelsea Manning issued an all inclusive invitation and the call to participate was answered. Several of us happily joined to support and help inform the Pride’s participants and spectators about Chelsea’s current situation, serving an unjust sentence of 35 years. A beautifully prepared flyer set out the facts of her heroic whistleblowing and highlighted Chelsea’s current position as a Trans woman seeking Hormone Replacement Therapy in a military prison that is currently being denied. Despite the rainy weather, the Pride March was well attended and organised. A Carnival atmosphere, so rare to be seen in this Northern European country, infused people with joy and optimism for the future. With this joy and optimism, we destributed flyers, stuck stickers on bodies in all stages of dress/undress (lol), held our banners and engaged with the public both on the March and in the crowds that had gathered to spectate. Our group of over a dozen was not alone, in our posters, banners, flyers, stickers, an entire community was partaking from graphic designers and photographers to donors and social media activists. On the same day Chelsea Manning was also remembered at the Dublin Pride parade. What did come into contrast with this atmosphere of genuine joy was a certain element of corporatism present in form of sponsorship that I personally found out of place. For example BAE Systems’ (British Aerospace) professionally made banner proclaimed “Proud of who we are” but also included “Proud of what we do”. Their logo was all over their Banner, T-shirts, and they were handing out goodies to the crowd. It made me wonder whether the message of the Pride March was not usurped by employers for their PR campaigning. Was such sponsorship necessary? Many thanks to Oli for organising the contingent and giving us the opportunity to March in solidarity with Chelsea in celebration of who she chooses to be, always challenging the status quo with a hopeful message that change is a good thing; we only have to dream about it, and find the courage to pursue it, for it’s worth it! Time is on her side. Gallery | This entry was posted in London. Pride, Manning, WikiLeaks and tagged Chelsea Elizabeth Manning, London Pride 2014, WikiLeaks. Bookmark the permalink.